Aah, the joy of aging! Of course, some of us age gracefully like a fine Bordeaux wine. However, most of us do not. Fortunately, plastic surgery can improve many signs of facial aging. As always, I recommend avoiding the sun and discontinuation of smoking. This is the cheapest plastic surgery one can receive and it’s almost free! Starting from the forehead region, some of us will develop a drop (or ptosis) of the forehead, resulting in sagging of the eye lid skin. The tell-tale sign of brow ptosis is hooding of the lateral eye lid skin. If, from side view, the lateral eye lid skin has a fold, like a hood, then a brow lift is recommended. It is critical to elevate and correct the brow ptosis before removing any excess eye lid skin. The forehead muscle has gotten used to the excess “weight” from brow ptosis. If the excess skin is removed, the brow, in time, will drop more. It is then very difficult to elevate the brow, since too much skin has already been removed, resulting in inability to close the upper eye lid. If brow ptosis is not present and only excess upper eye lid skin is present, then an upper blepharoplasty is performed. Although the upper eye lid fat was routinely removed, in the past decade we have realized this will result in a hollow upper eye lid, exaggerating the aging of the eye lid region. For this reason, I generally do not remove any fat with the skin. This is a relatively easy procedure, and can be done in the office with local anesthesia. The lower eye lid usually develops a groove between the eyelid fat and the cheek region, resulting in a “hollow” look. The lower eye lid fat may also become prominent. In the old days, plastic surgeons removed the fat to smooth out the prominence. Unfortunately, with time and aging, this resulted in a much worse deformity and a “concentration camp” look. I usually perform a trans-conjunctival (the incision is made inside the lower eye lid) and reposition the fat under the skin. This re-draping not only improves the bulging, but will “fill in” the groove deformity discussed previously. The lower eye lid region can be further improved with a mid-face (cheek lift). Essentially, after the facial skin has been elevated, the cheek soft tissue is repositioned in a more aesthetically pleasing location. This not only enhances the cheek area, but also will help correct the hollowness of the lower eye lid region. The neck usually has two areas which need to be addressed. One is the loosening and separation of the muscle underneath the neck skin (platysma muscle). The other issue may be actual loosening of the neck skin. The platysma muscle can be brought together using an incision under the chin area. 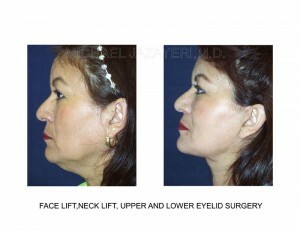 If excess, loose neck skin is still present, then a neck lift will be required. It is important to place the incisions in areas which are not readily visible. The facial tissue should have harmony and “flow together”, like a symphony. The result should be as natural as possible. I have enclosed a before and after photo to demonstrate the effectiveness of this procedure. Michael A. Jazayeri, M.D. is a board certified plastic surgeon with over 10 years of experience. His office is located in central Orange County. To schedule a complimentary consultation, please call 714-834-0101.